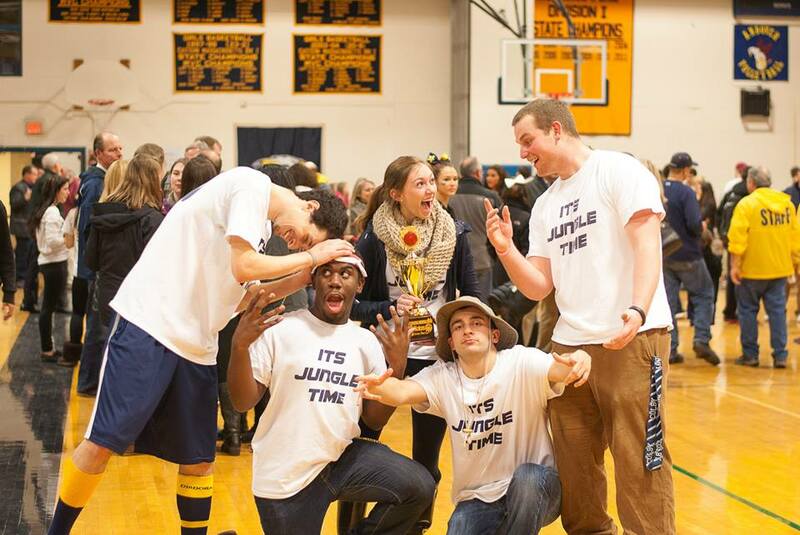 On Friday, Jan. 10, the Jungle, Andover High School’s fan section, received the Commonwealth Cup for Best Fan Section at the Christmas tournament held by the Merrimack Valley Conference. Every winter break, the Merrimack Valley Conference holds a boys and girls basketball Christmas tournament called the Commonwealth Christmas Classic. A trophy is given to the high school that wins the tournament. This year, someone donated another trophy to be given to the best fan section. AHS is the first recipient of this award. The Jungle won due to its “organization, decibel level, and color coordination,” said the Commonwealth Classic. The AHS boys basketball team ended up winning the Christmas tournament. The Jungle won the trophy due to the school spirit demonstrated at the Christmas tournament games against Lawrence High School and Central Catholic. 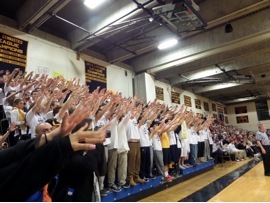 The Jungle beat North Andover High School’s fan section with a final score of 83­-75. The award was presented by Fennis Dembo, 47, a retired basketball player who played for the Detroit Pistons’ 1989 NBA championship team. “I am excited to see how much our Jungle can improve and hopefully we can really impress Fennis even more throughout the season,” said Taylor. Both Fazio and Goldstein said that the school should be proud of winning the award. Fazio said that winning it had “everything to do about our student body coming together.” He is also impressed by the positive culture and environment the students have created. He said that the students are able to enjoy each other’s company. Taylor said that she has met “so many great people” due to the Jungle. Though the Jungle still has some work to do, the fact that they won the award for Best Fan Section demonstrates the dedication and school spirit here at AHS.